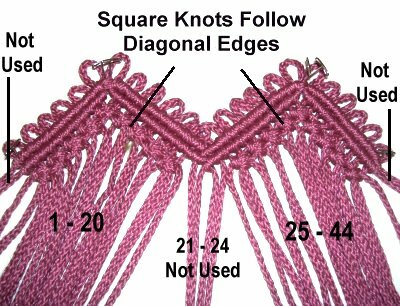 Description: The Picot Purse features vintage knots called picots (small loops), along the edge of the flap. There are diamond shaped designs on the flap as well. The strap also has picots, arranged vertically. 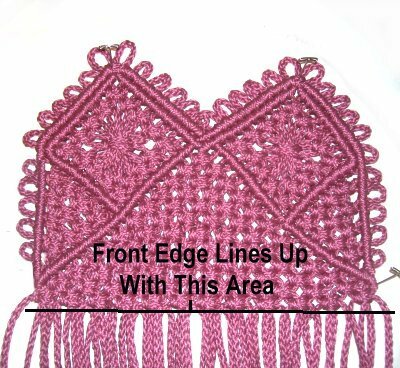 This Macrame pattern requires experience, which is why it's listed in the Advanced section. You will need to tie some knots without a board. The width and length of the handbag is 9 inches. The strap is 32 inches long, measuring from where it attaches near the top the purse. The flap folds over the front like a messenger bag. A beaded tassel-like design creates a simple closure. The tassels at the bottom are optional. Step 1: Cut 12 cords, each 5 yards long. Prepare the ends with tape or glue to prevent fraying while you work. Fold two cords in half and secure them side-by-side. Mentally number the four segments. 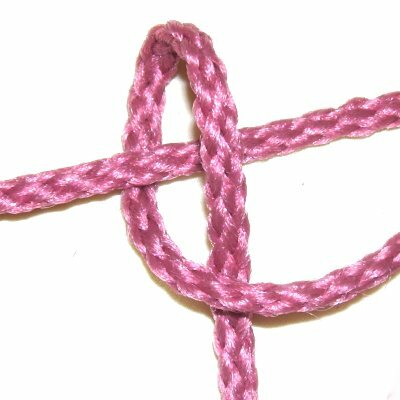 Tie a Square Knot (SK) with segments 1 and 4, around 2 and 3. Tighten it as much as possible. 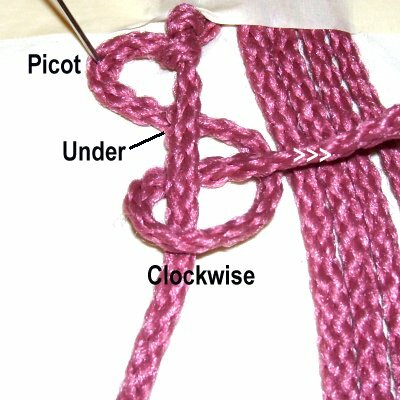 Adjust the picot loops above the knot to 1-inch. Secure segments 1 and 4 diagonally, to the left and right. They both should have tension, since they are holding cords. 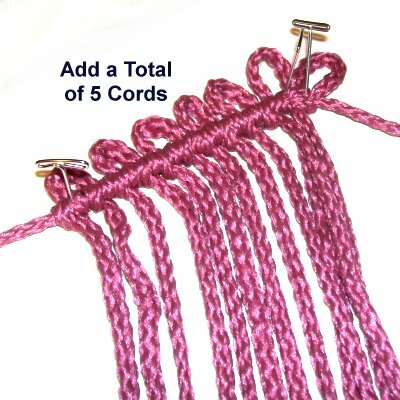 Mount a new 5-yard cord to holding cord 4. Start by folding the cord in half. Place it 1/2 inch above the holding cord. 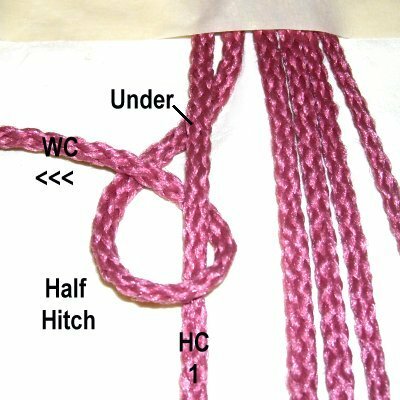 Attach both ends to holding cord 4 with a Double Half Hitch (DHH). 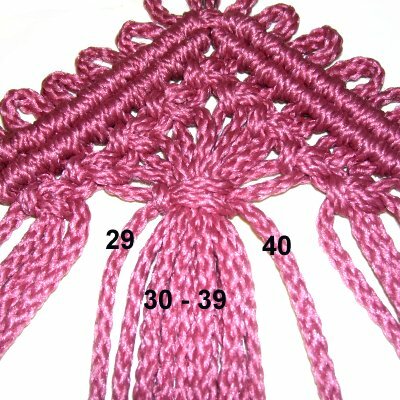 Measure the picot, and adjust the size if necessary (1/2-inch). Avoid twisting the working cords, by folding them around the holding cords so they remain straight. Arrange the knots so they do not overlap. Mount 4 more cords in the same manner (total of 5). Mount 5 cords to holding cord 1 in the same way, making sure the picots are 1/2-inch in size. 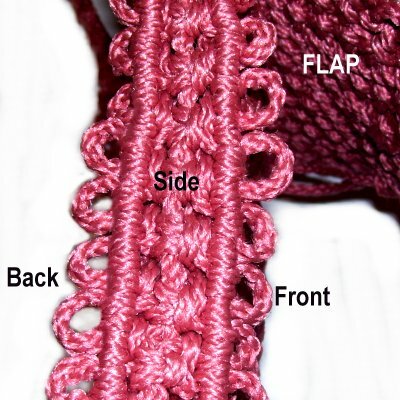 Step 2: Repeat step 1 to create another V shaped design for the flap of the Picot Purse. Arrange both designs on your board. Adjust the angle of both V shapes so they are a total of 10 inches wide, when measuring from the left edge to the right. Secure them when you have the correct width. 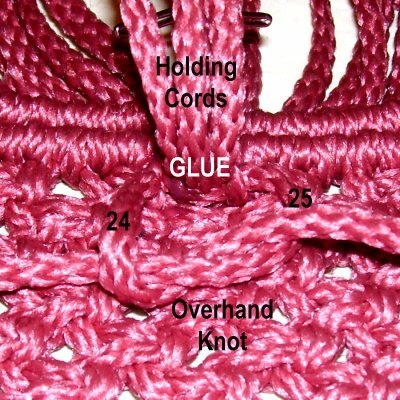 Important: Secure the first picot loops you made, at the top point of each V shape. Step 3: Mentally number the cords 1 - 48. Attach cord 24 to cord 25 with a DHH. These are the two holding cords from steps 1 - 2. 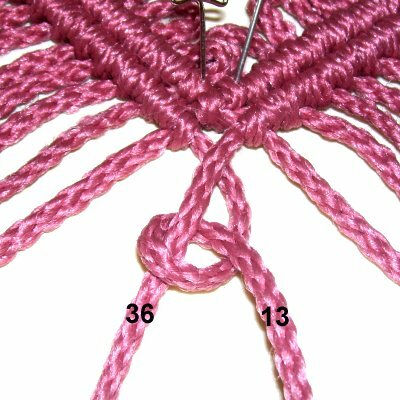 Step 3, continued: The two bars along the edge of the Picot Purse should be close to each other, so tighten the following knots firmly. Cords 12 and 13 are the second set of holding cords for the left V design. Move them to the right and left, on the same angle as the first row of DHH. Attach cords 11 - 2 to holding cord 12 with DHH. Do not attach cord 1. Attach cords 14 - 24 to holding cord 13 with DHH. For the right V design, use cords 36 and 37 as the second set of holding cords. Attach cords 35 - 25 to holding cord 36 with DHH. Attach cords 38 - 47 to holding cord 37 with DHH. Do not attach cord 48. Attach holding cord 13 to holding cord 36. 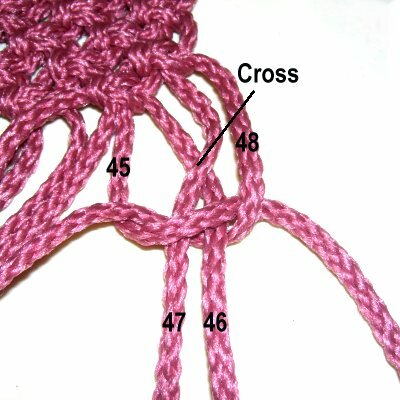 This knot is in the center of the Picot Purse, where the two V designs are connected. Step 4: Now you will tie Alternating Square Knots that follow the diagonal edges of the Double Half Hitches. 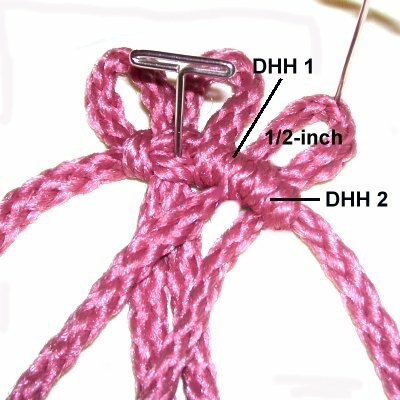 Tighten the knots firmly, so they are as close to the DHH as possible. 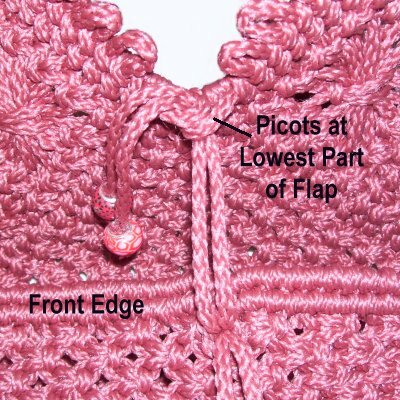 Do not use the first and last 2 cords at the edges of the Picot Purse. These were holding cords from the rows of DHH. Mentally number the remaining cords 1 - 44. Cords 21 - 24 are not used in this section. Cords 9 - 12 (below top point). Cords 7 - 10 and 11 - 14. Cords 5 - 8 and 13 - 16. Cords 3 - 6 and 15 - 18. Cords 1 - 4 and 17 - 20. Cords 33 - 36 (below top point). Cords 31 - 34 and 35 - 38. Cords 29 - 32 and 37 - 40. Cords 27 - 30 and 39 - 42. Cords 25 - 28 and 41 - 44. 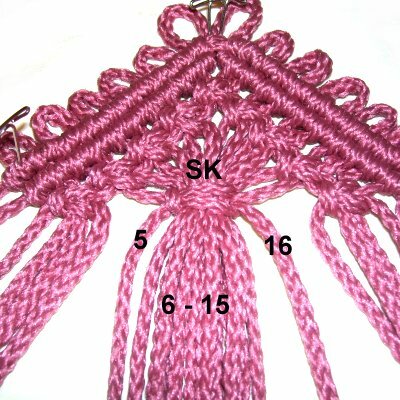 Step 6: You will now tie large SK in the center of each V shape, straight down from the top point. Important: Keep the fillers organized by applying small pieces of tape to each one. Write their position numbers on the tape, before tying the knots below. Left V Design: Use cords 5 and 16 to tie the SK. The fillers are cords 6 - 15. This SK should line up with the first and last SK in that section (made with 1 - 4 and 17 - 20). Right V Design: Use cords 29 and 40 to tie the SK. The fillers are cords 30 - 39. This SK should line up with the SK made by 25 - 28, and 41 - 44. Step 7: You now reverse the process (steps 4 - 5), to tie the lower rows of SK. This turns the V shapes into diamonds. Make sure you keep the cords organized, and select the right ones. Cords 27 - 30 and 39 - 42 to tie the ASK. Step 8: Mentally re-number all the cords 1 - 48. Remove the tape. Cords 1, 48, 24 and 25 are not used in this step. Move cord 2 along the left edge of the diamond on the left, to be used as a holding cord. Attach cords 3 - 12 to it with DHH. Move cord 23 along the right edge of the same diamond. Attach cords 22 - 13 to it, and cord 2 (left holding cord). 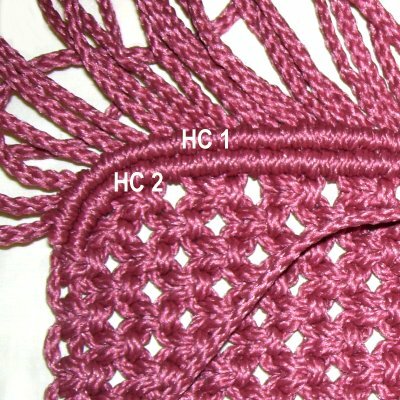 For the diamond on the right side of the Picot Purse, use cord 26 as the holding cord for the left edge. Attach cords 27 - 36 to it with DHH. 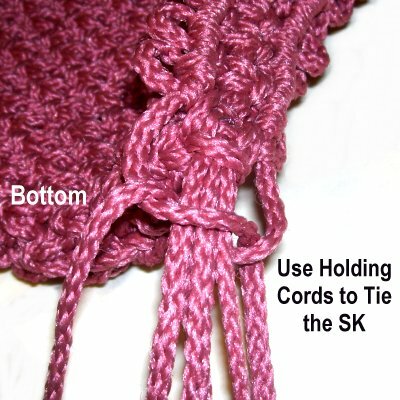 For the right edge, use cord 47 as the holding cord. Attach cords 46 - 37 to it with DHH. 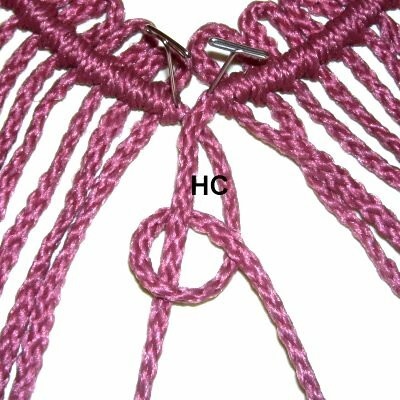 Step 9: Now you will tie Vertical DHH with picots along the left edge of the Picot Purse, just below the diamonds. Move cord 2 under cord 1. Use it to tie a vertical DHH onto cord 1. 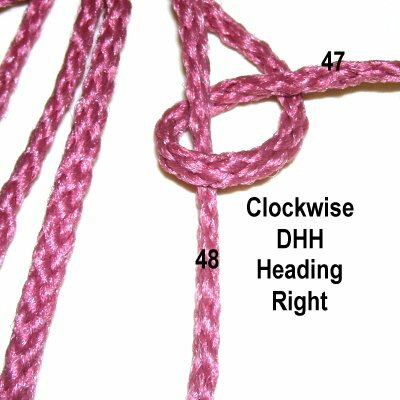 The end should be heading towards the left, and the knots tied counter-clockwise. Important Tip: See the photos for step 22 and 23 if the following direction change is confusing to you. Bring the end of cord 2 under cord 1, heading right. Fold it to form a 1/2-inch picot, and secure it at the fold. Attach cord 2 to holding cord 1 with a DHH, rotating clockwise. Step 10: Now you will be making a sideways V shaped design with Alternating Square knots and picots. You repeat step 9 to make each picot. Tie a SK with cords 2 - 5. 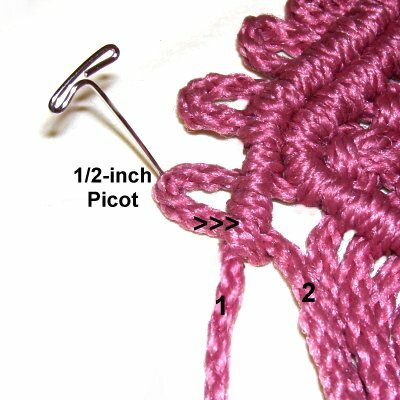 Make one picot (step 9). Tie a SK with cords 4 - 7. Tie the SK with cords 2 - 5 and with cords 6 - 9. 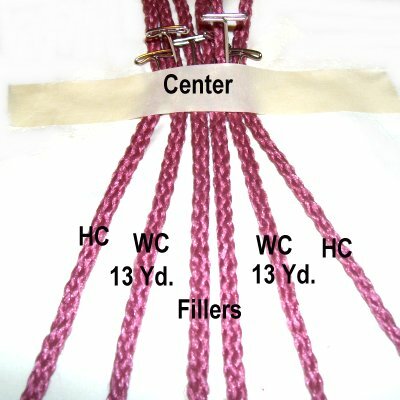 Tie a SK with cords 4 - 7 and with cords 8 - 11. 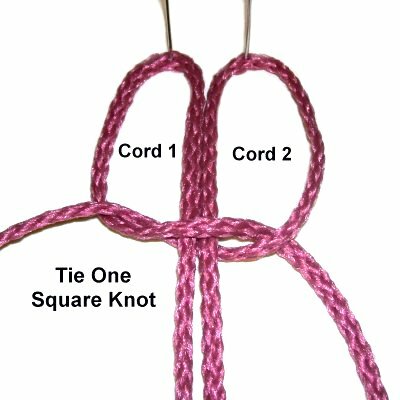 Position cord 12 along the right edge of the knots you just tied, diagonally. Attach cords 11 - 1 to it with DHH. 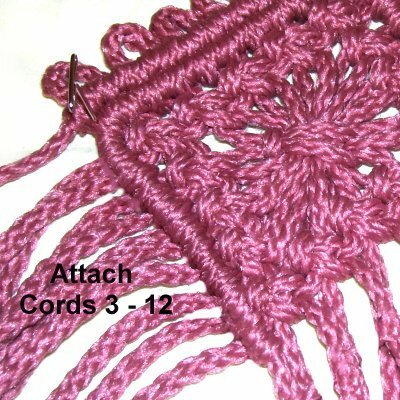 Step 11: To make the same design on the right side of the Picot Purse, you use the same instructions as step 9 to make the picots. Clockwise heading right for the first DHH. 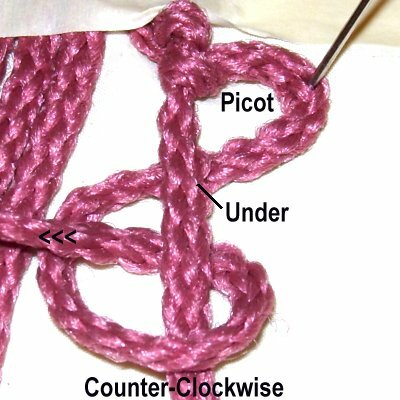 Counter-clockwise heading left for the second knot, after the picot is made. 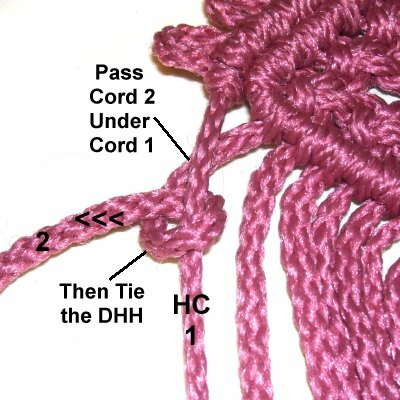 Use cord 47 to make the DHH with picots, onto holding cord 48. Tie a SK with cords 44 - 47. Tie a SK with cords 42 - 45. Tie a SK with cords 44 - 47 and with cords 40 - 43. Tie a SK with cords 42 - 45 and with cords 38 - 41. Place cord 37 along the left edge of the V design. Attach cords 38 - 48 to it with Double Half Hitches. 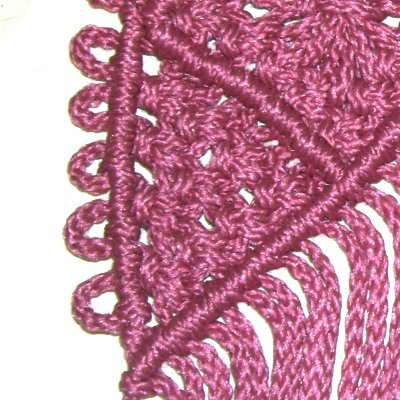 Step 12: Now you will make the back of the Picot Purse, which starts in the center area of the flap, between the diamonds. The cords used in each row are described below. Mentally re-number the cords 1 - 48. Row 1: Tie one ASK with cords 23 - 26, which are at the top point. Row 2: Use cords 21 - 24 and 25 - 28. Row 3: Use cords 19 - 22, 23 - 26, and 27 - 30. Row 4: Use cords 17 - 20, 21 - 24, 25 - 28, and 29 - 32. Row 5: Use cords 15 - 34 in groups of 4. Row 6: Use cords 13 - 36. Row 7: Use cords 11 - 38. Row 8: Use cords 9 - 40. Row 9: Use cords 7 - 42. Row 10: Use cords 5 - 44. Row 11: Use cords 3 - 46. Row 12: Use cords 1 - 48. Row 13: Use cords 3 - 46. Step 13: As you tie the next row using cords 1 - 48, cross cords 2 and 3, as well as 46 and 47, so they switch places. These are fillers for the first and last knots. The reason for the switch is because they are shorter than the others. Step 14: Tie 49 rows of ASK to make the back, bottom, and front of the Picot Purse, in one continuous piece. The next row is tied with 3 - 46, followed by 1 - 48, and so on. Tighten all the knots firmly, so they all rest close together. Double check to make sure the last row is tied with cords 3 - 46. Step 15: Tie one more row, with cords 5 - 44. Step 16: Move cord 2 along the front edge of the Picot Purse (left holding cord). It will curve as you attach the others. Attach cords 3 - 23 to it with DHH. Move cord 1 into position, and attach cords 3 - 23 to it with DHH. Step 17: Move cord 47 along the edge (right holding cord). Attach cords 46 - 26 to it with DHH. Move cord 48 into position, and attach cords 46 - 26 to it with DHH. 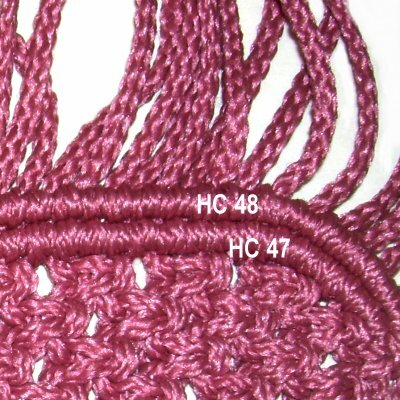 Step 18: In the center front edge of the Picot Purse, locate the four holding cords (1, 2, 47, 48). Arrange them between cords 24 and 25, which were not attached in the previous steps. Step 18, continued: Use cords 24 and 25 to tie a tight Square knot around the four holding cords. Step 19: Flip the four holding cords out of the way. Use cords 24 - 25 to tie a tight Overhand knot, so it rests under the holding cords, near the SK. Apply glue to hold the knot in place. 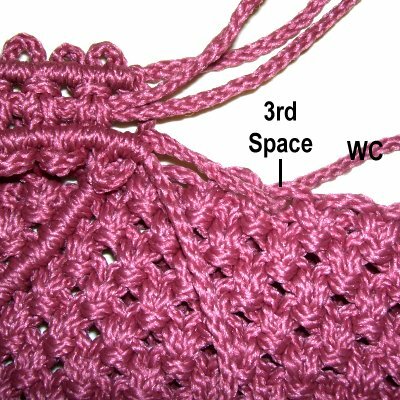 Step 19, continued: Pass the ends through spaces to the back (or inside) of the Picot Purse. Finish off cords 24 - 25 by tying another Overhand knot. Trim the ends to 2 inches and weave them through the back of the knots in the area. Step 20: To finish the edge, pull each cord to the back (inside) of the Picot Purse. 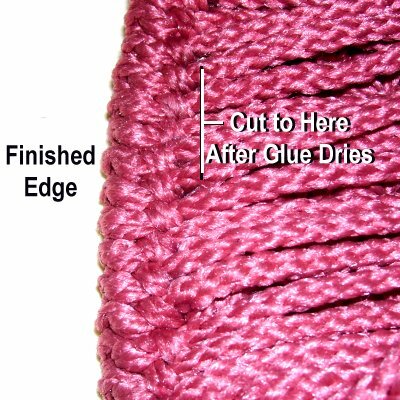 Trim them to 2 inches, and slide each one under the back of the DHH from the first row you tied, NOT the row that forms the edge (2nd row). Apply glue to hold them in place. This is what the back will look like when you are through. After the glue dries, trim each cord to 1/4-inch beyond the DHH they rest under. You can then heat fuse the ends if the material is nylon, and is able to melt. Step 21: Cut 2 cords, each 13 yards long, as the working cords for the strap of the Picot Purse. Multiply the length you want by 14 and divide by 36. Round up to the nearest whole number. Cut 2 holding cords and 2 fillers, each 2 yards long. Prepare the ends of all 6 cords to prevent unraveling. Arrange the cords as follows, securing them at the center. Place tape horizontally to mark the center. Important: The 2-yard cords on the outside are the holding cords for the DHH picots. The 2-yard cords in the middle are fillers for the Square Knots. Apply tape to the fillers, so you can identify them easily. Step 22: The picots for the strap are made very similar to step 9. First, move the left working cord under the left holding cord next to it. Tie the DHH rotating counter-clockwise, so the end is heading left. The knot should rest against the tape. 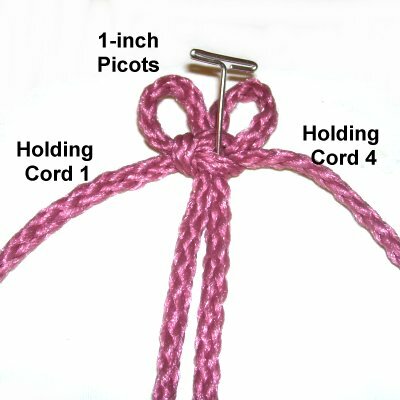 Fold the working cord to form a 1/2-inch picot, and secure it at the fold. Bring it under the holding cord from left to right. Tie a clockwise DHH, so the end is heading right when you are finished. Measure the picot and make adjustments if needed. Step 23: The right side of the strap is tied the same, but the direction of the DHH is changed. Pass the right working cord under the right holding cord. Tie a clockwise DHH, so the end is heading right. 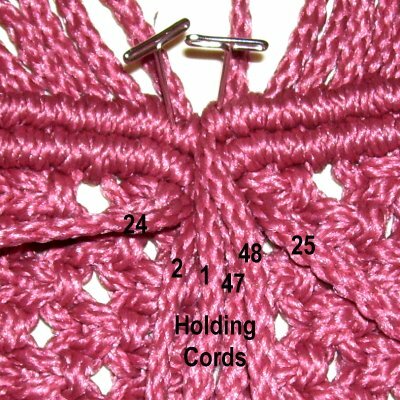 Form the picot with the working cord and secure it. Bring the working cord under the holding cord, heading right to left. 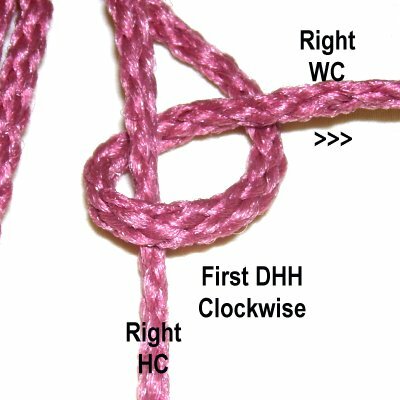 Tie a counter-clockwise DHH. Step 24: Use the two working cords to tie a tight Square Knot around the fillers. Do not use the holding cords for this step. Step 25: Repeat steps 22 - 24 until the first half of the strap measures 16 inches. 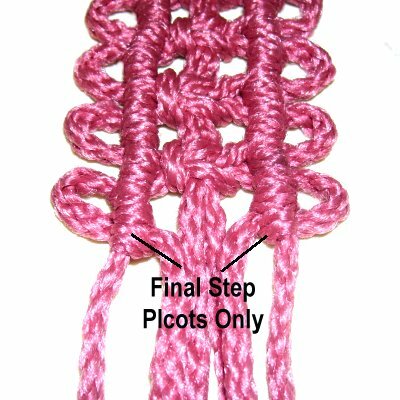 Stop on step 23, so you end with the picots (not the Square knot). Step 26: Turn the strap for the Picot Purse, so you start the second half at the center. Tie right SK for this half, so the strap is the same all the way down. The image shows the first step of a SK. 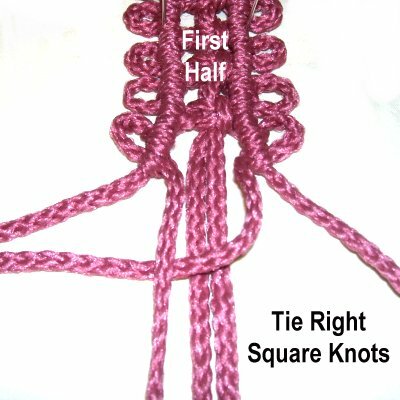 Repeat steps 22 - 25, starting with a Square knot, and ending with the picots. Step 27: Now it's time to make the sides of the Picot Purse, where the strap is attached to the front and back. 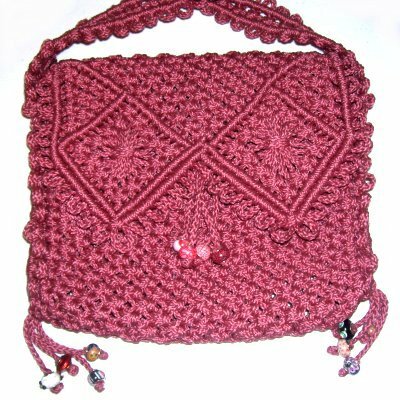 The front of the purse is the edge where you finished with two rows of DHH (steps 16 - 17). Locate the knots below the sideways V shaped designs on the sides of the flap. It's where you started the back of the purse, in step 13. Note the loops along the edges of the ASK. That's where the cords for the strap pass through to link the two halves. Start by folding the Picot Purse, so the finished edge of the front lines up with the last SK in the flap. This is just below the DHH on the sides. Step 28: Pass the right working cord through the first space you come to in the front, directly below the curved edge. Make sure you pass it through from the top. 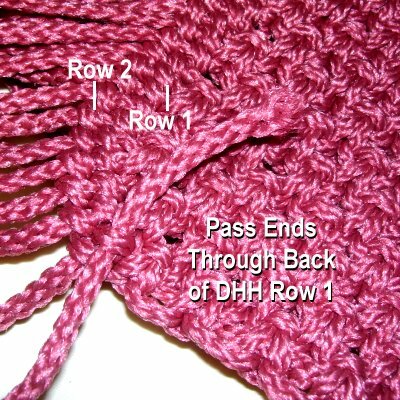 Step 29: Locate the row of DHH at the edge of the flap. Move down to the 3rd space along the edge of the ASK, and pass the left working cord through (from the top). Step 30: Place the Picot Purse between your knees, so you can clearly see the front and back, with the strap between them. Tie a SK with the working cords around the fillers, as you did when you created the strap. The fillers are the ones with the tape. Step 31: Go to the other side of the purse and repeat steps 28 - 30. Make sure the strap is not twisted. 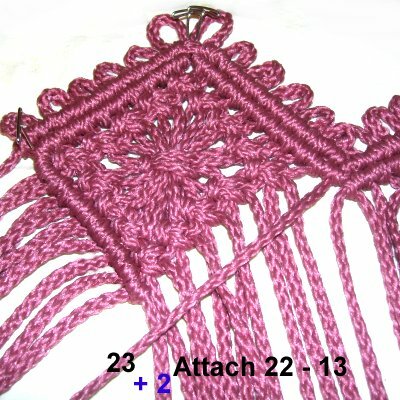 Step 32: Continue making picots and Square Knots as in steps 22 - 24. Do this on both sides. 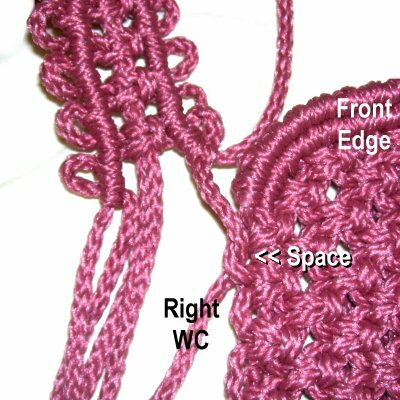 After you make each picot, pass the working cord through a new space (back or front). 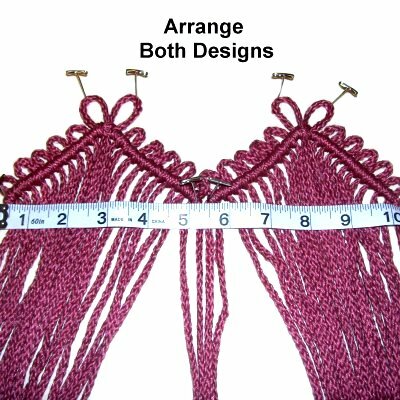 Important Tip: This process is much easier if you line up the spaces in the front and back portions before tying the knots. You can still use pins to support the picots as you tie the DHH, but they won't be as sturdy. Attach the pins to the purse itself rather than the project board, so you can keep it between your knees. 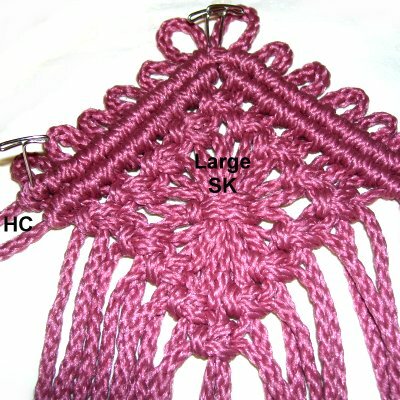 Step 33: When you reach the bottom of the Picot Purse, pass the working cords and fillers through one space. Use the holding cords to tie the SK around the other four. Step 35: You now need to decide if you want beaded tassels at the bottom of the Picot Purse, to finish off the strap cords. No Tassels: Trim the ends of all 6 cords to 3 inches, and pull them to the inside of the purse. Weave them through the spaces at the bottom and apply glue to hold them in place. 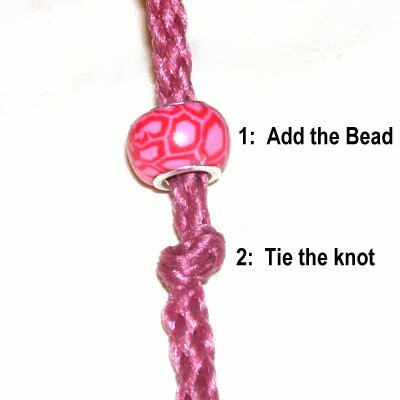 1: Slide the bead onto the cord. 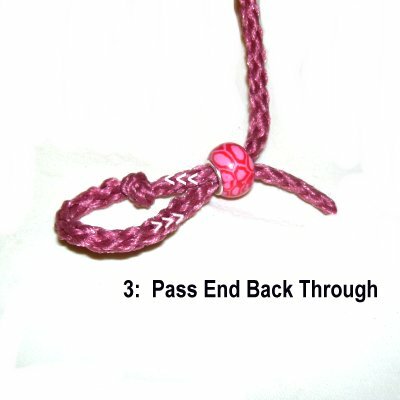 2: Tie an Overhand knot where you want the bead to rest. 3: Pass the end back through the hole in the bead. Step 36: To make the closure for the Picot Purse, repeat step 35 with the four cords in the center front area (see step 18). Pass two cords through the picots in the center of the flap, at the lowest part between the two diamonds. 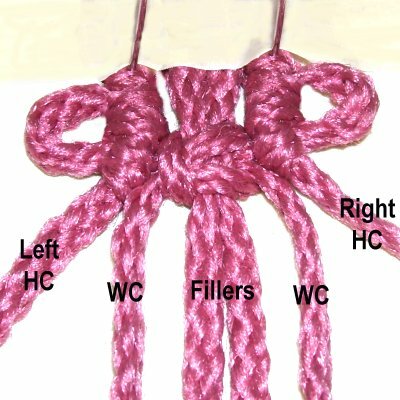 Pull the ends down and combine them with the other two cords, tying a LOOSE Overhand knot to form the closure. 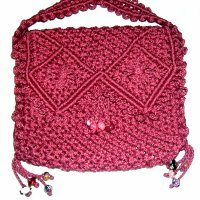 Have any comments about the Picot Purse? Contact Me.